A most beautiful course bordered on one side by the Sound of Taransay, leading onto the Atlantic Ocean. All down the west side of the course stretch the white sands, typical of this part of the Hebrides. Although only a nine hole course many of the holes are very demanding with more than a few natural hazards. Among the many famous golfers who have played the course are Nick Faldo and Ronan Rafferty. 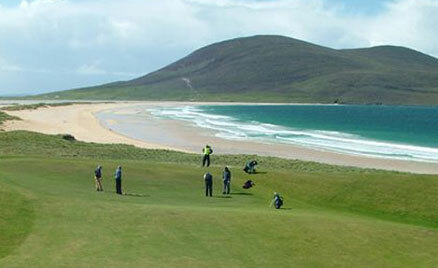 The Isle of Harris Golf Club plays an integral part in promoting the island of Harris as a top quality holiday destination for golfers and non-golfers alike. The natural surroundings are breathtaking and this coupled with the extensive birdlife, wildlife, unique culture, music, language and arts, make Harris a much sought after destination for the discerning tourist.